Proudly display your support for a healthier future. Follow the instructions below to add one of the Healthy People Web badges to your Web site or blog. Copy the HTML code of the badge you want to add. Paste the code into the HTML of your Web page. We appreciate your interest in linking to HealthyPeople.gov and look forward to your support in creating a healthier nation for all Americans. We invite partners and other responsible organizations and individuals on the Internet to link to HealthyPeople.gov to promote a mutual goal of making Healthy People come alive for all Americans. 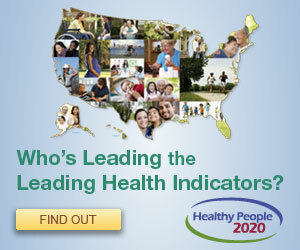 HealthyPeople.gov has been developed by the U.S. Department of Health and Human Services and focuses on Federal resources. Our content guidelines do not permit us to link back to every organization; however, we welcome all of your comments and suggestions. Please Note: Any link you establish must avoid the appearance that HealthyPeople.gov endorses any information supplied by others or any specific product or service, since Federal law prohibits the government from doing so.